Three is never a crowd with our fabulous three stone setting rings. Combining three beautifully cut diamonds, carefully hand selected and set in exquisitely decorative gold and platinum bands, each three stone setting is a work of art. 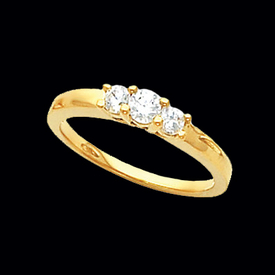 A three stone setting engagement ring or wedding band is second to none. Beautiful Platinum 2ct tw three stone diamond wedding ring. 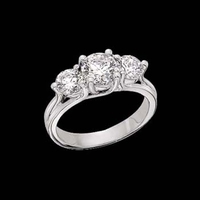 Round trellis design is set with a 1 carat center diamond and 1/2ct on either side for a total of 2 carats. Diamonds are SI 1 clarity G-H color. Fantastic ring. Platinum Antique design diamond wedding ring. 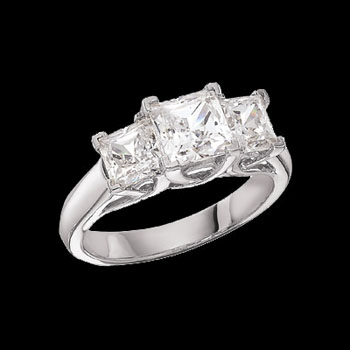 Antique ring design is set with three princess cut diamonds. Center diamond is a 1 carat SI 1 clarity G-H color stone, diamond on either side is 1/2ct tw. A 2 carat diamond wedding ring. Available in 14k Gold, 18K gold, and Palladium, email for pricing. Beautiful Platinum three stone diamond wedding ring. Center diamond is a 1/2 carat stone, diamonds on either side are 1/4ct each. Additional accent diamonds total 1/4ct tw for a diamond ring total of 1.25ct tw. Diamonds are SI 1 clarity G-H color diamonds. Our great price is for the Complete Ring. Platinum three stone diamond wedding ring. You'll love this Trellis design set with princess cut diamonds. Diamonds total an incredible 2 carats. Center diamond is a 1 carat stone, 1/2 carat set on either side. Available in any metal, price shown for Platinum. Platinum Three stone diamond wedding ring. 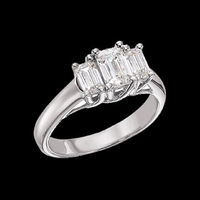 Three emerald cut SI 1 clarity G-H color diamonds set in a Platinum trellis design create this lovely wedding ring. Center diamond is a .75 carat stone with a .40ct on either side. Total diamond weight approx.. 1.50 carats. Larger diamond weight available in this style, email for pricing.